It is not a disease in itself but a symptom of other diseases. Aconite 6-30—Congestion of head giving rise to a sense of fullness inside; hemicrania (headache of one-half of the head; throbbing of temples, even of the eyes. Rest gives relief; movement hanging down the head or noise, aggravate the headache. Belladonna 3, 6, 30-Throbbing pain in the head; intolerance of light and noise; pain comes on, lasts for sometimes and ceases suddenly. Worse lying down and in the afternoon. Melilotus 1x—Headache with retching and vomiting. Congestive, throbbing frontal headache. Sick headache relieved by bleeding from the nose or from menstrual flow (use Ө or 1x) every ½ hour. Gelsemium 3—Everything appears dark during headache. Crotalus 6—Patient walks slowly or on top toe to avoid jerk to his head. Dull heavy occipital pain on right side and right eye. Headache with pain in heart on lying on left side. throbbing headache, nausea before menses. Severe pain in the centre of the forehead, dilated pupils; profuse menses. Ignatia 6-30—Headache due to excitement or worry and vexations. Nitric Acid 6-30—Pain in the back part of the head. Magnesium Phos. 2x-12x (trit. )— (To be taken in hot water). Unbearable pain, shifting from place to place and disapperaing at times. Arnica 6-30—Headache is due to flow of blood to the head or nervous debility; heaviness of the eyelids, vision appears to be now lost, now seeing flashes of light; eyes injected; burning sensation in eyes; head feels hot; throbbing of the vessels of temple and neck; aggravation of pain by light, loud sounds or movements; and relief on taking rest; chronic headache to injury. Bryonia 3, 6, 12, 30—Headache is due to congestion or gout; aggravation by movements; giddiness; heaviness of head; bursting sensation in forehead on stooping; pain in the temples, relieved by pressure, right hemicrania; repeated eruptions and bilious vomit; nose-bleed aching pain in the forehead; feels as if the skull would burst. Calcarea Carb. 30—Headache due to excessive mental strain; morning headache; sweating of upper half of the body at night; hemicrania; repeated eructations on empty stomach, with cold feeling in the head. China 6, 12, 30—Humming noise inside the ears; flushed face; weakness; frequent yawning. Ignatia 3-30—Headache due to agony or suffering bereavement; headache of hysterical patients who feel ball- sensation inside the abdomen; pain as if a nail is being driven; headache confined to one part of the head. Lilium Tig. 6 —Pain and heavy sensation all over the top of head; desire to relieve to heaviness by supporting it with the hands; headache from left temple to back of head; morning diarrhoea with heavy sensation of head; headache due to menstrual troubles; aggravation of headache on exposure to cold-draughts and relief after sunset. Nux Vomica 6,12,30—Giddiness; throbbing of vessels of temples; splitting headache; nausea or vomiting; constipation; aggravation of pain after meals, mental exertion and on stooping; headache of the stout and the strong; hemicrania commencing in the morning and disappearing at night; acid or bilious vomit; headache of drunkards or of dyspeptics and patients suffering from piles. Pulsatilla 3, 6, 12—Headache due to indigestion of fatty food; or to disease of female organs; pain behind ear, like that of a nail being driven in. Phosphoric Acid 6-30—Pain in head and neck due to nervous debility or sexual neurasthenia; loss of memory: impairment of hearing and eye-sight. Sepia 6, 12, 30—Sense of weight and lancinating pain; headache with nausea or vomiting following menstrual trouble; brow-ache; constipation. Silicea 6, 12, 30—Maddening headache; chill and nausea in the morning, with sense of weight on head; intense hemicrania; pain over the eyes, with inability to open them. Cimicifuga 3-30—Headache due to nervous paralysis or menstrual disorders; intense pain in head and eyes; aggravation of headache by moving the head, the pain radiating from forehead to the neck; dilatation of pupils on account of the intensity of headache; delirium and vacant stare; headache of feeble hysterical patients with a sensation of ball in the throat and with nausea; sleeplessness; headache of students and of drunkards. Cyclamen 3-30—Intense headache; sees number of colours playing before the eyes; aggravation of headache in the morning and during menses. Iris Vers. 3—Right-sided headache with nausea or vomiting (with faulty liver or with history of over-study). Kali Bich. 6—Frontal headache just over the right eye. Blindness followed by severe headache. Spigelia 3-200—Tearing pain in the forehead, aggravated by movement and accompanied by palpitation and restlessness; the pain extends to the eyes; pain is relieved by pressure; left sided hemicrania, commences in the morning, increases till noon, disappears at night. Sanguinaria 3—This is pre-eminently a right sided remedy. 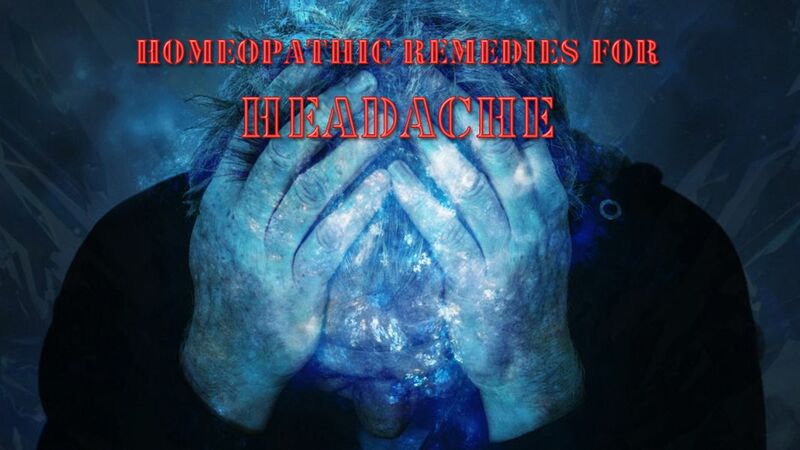 Headache only during the day-time; right-hemicrania; headache every seventh day; headache during menopause. Periodical sick-headache; begins in morning, increases during day and lasts until evening. Bursting headache, sensation as if the eyes would be pressed out. Throbbing headache, lancinating pains through the brain, worse in right side, especially forehead. Chionanthus Virginica 1x— Headache, with nausea or due to biliousness. Headache occurring at periodical intervals. Glonoine 3—Headache due to exposure to sun or fire on the strong gas or electric light. Congestive throbbing headache; headache with increased secretion of urine. Brain feels too large for the skull. Hemicrania, Sun Headache. Headache increase and decrease with the sun. Sulphur 6, 12, 30—Throbbing pain behind the ears and in forehead; heat on the top of head; morning dizziness, headache or dizziness due to sudden stoppage of bleeding from piles. Verat. Viride 3x-30—Fullness and heaviness of head; throbbing of vessels; burning in ears; unconsciousness; diarrhoea with nausea, vomiting. Petrol. 3-200—Headache from anger, or excessive mental exertion. Frontal headache, at times quite severe, worse while nausea continues. Headache of long-standing with retching and vomiting. Chronic Headache: —Sulphur, Calc. Carb., Natrum Mur., Chininum Sulph. (3x—3), Sepia, Kali Bi., Kali Carb, Sanguinaria, Nux Vomica, Ars., Zincum, Cocculus—all in 6—30 potencies. Accessory measures: —Fasting (partial or to the extent possible) is better than taking full diet. A cold compress or washing the head with water and vinegar are recommended. In cases where the headache is traced to the defect in eyesight, proper glasses should be used.